Together with our friends from the NEM Blockchain family, we had a successful visit to Kazakhstan. We discussed possible cooperations and implementations of LuxTag and the NEM Blockchain Technology. We had a packed programme, co-organized by our partners from Kazakhstan Rakhat Yelaman of Gharysh Sapary, Yevgeniy Litvinov of Blockchain Kazakhstan as well as the Blockchain & Crypto Channel Cryptodealers. Further special thanks to Klim Geran (https://nemnews.io)/, Misha Granin (NEM Industrial Partnership Coordinator for Russia & CIS), Julian V. (https://nemflash.io) and Denis Drushkov from ZEUS Exchange! 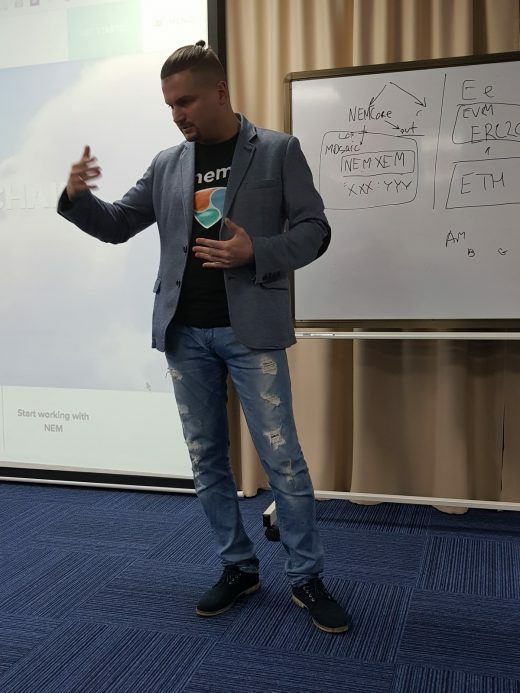 Misha Granin hosted the first NEM Meetup in Kazakhstan, and LuxTag was the VIP guest that night! The meetup was attended by 37 participants, held in the small auditorium at the Silk Way Business Center in Astana. Stay tuned for further news regarding international cooperation announcements. LuxTag provides the first ever digitized certificates of authenticity for consumer products (or machines, or vehicles, etc.) on a blockchain that are updatable, can have messages attached, and their conjoint ownership can be flexibly transferred. Learn more about LuxTag at www.luxtag.io and find the project brief brochure at luxtag.io/brochure.pdf. Our project uses the NEM Blockchain Technology, which powers the mechanisms LuxTag leverages on.